We have not had the pleasure of meeting, but I do hope we get the chance soon. I am the consulting coordinator for the newly revitalized Greenpoint Business Association and we have launched our first marketing campaign for Greenpoint local businesses who are members. The about section on the web site / blog can fill you in on the details of what the members receive and how they support the community. 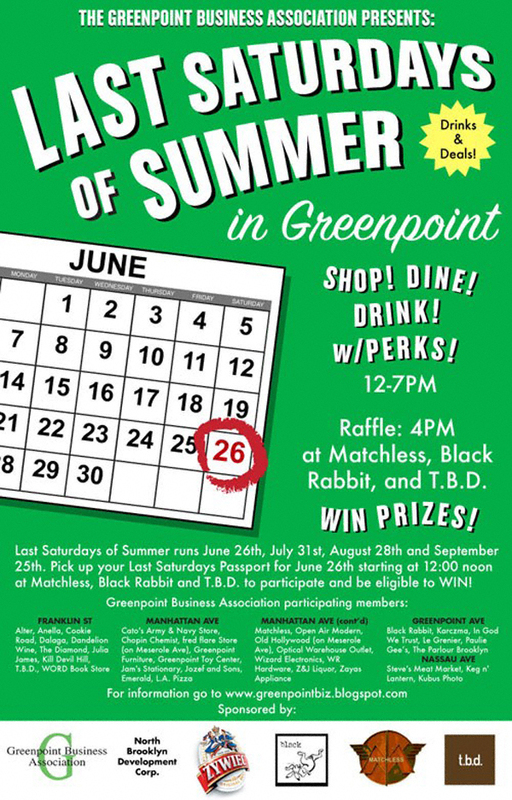 You can get the full lowdown on Last Saturdays of Summer, including a roster of participating businesses, by pointing and clicking your way over to the Greenpoint Business Association’s web site. Check it out! Tags: 11222, Bar Matchless, Black Rabbit, Franklin Street, Greenpoint, Greenpoint Avenue, Greenpoint Brooklyn, Manhattan Avenue, t.b.d.